In a small bowl, combine the oil, grapefruit juice, lime juice, 1/4 teaspoon of the salt, and 1 tablespoon of the chives. Put the fish, skin-side down, in a shallow glass dish or stainless-steel pan. Scatter the onion over the fish. Pour half of the citrus dressing over the top; let marinate for about 15 minutes. Heat the broiler. Put the fish, skin-side down, on a broiler pan or baking sheet. Sprinkle with the remaining 1/2 teaspoon salt and the pepper. Top with the onion. Broil the fish, about 6 inches from the heat if possible, until just done, about 5 minutes for 3/4-inch-thick fillets. Pour the remaining dressing over the hot fish and sprinkle with the remaining tablespoon of the chives. 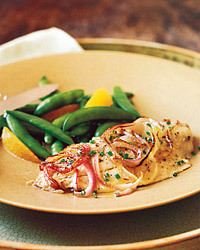 Fish Alternatives Any rich, full-flavored fish fillets would benefit from the acidity in the citrus dressing. Try mackerel, shad, kingfish or porgy. Just as the citrus here flatters the fish, a light white wine with lots of acidity will balance its oiliness while matching the grapefruit and lime flavors. Try a Vinho Verde from Portugal or a Sauvignon Blanc from South Africa.